11th Doctor "anniversary" waistcoat pattern, now shipping! 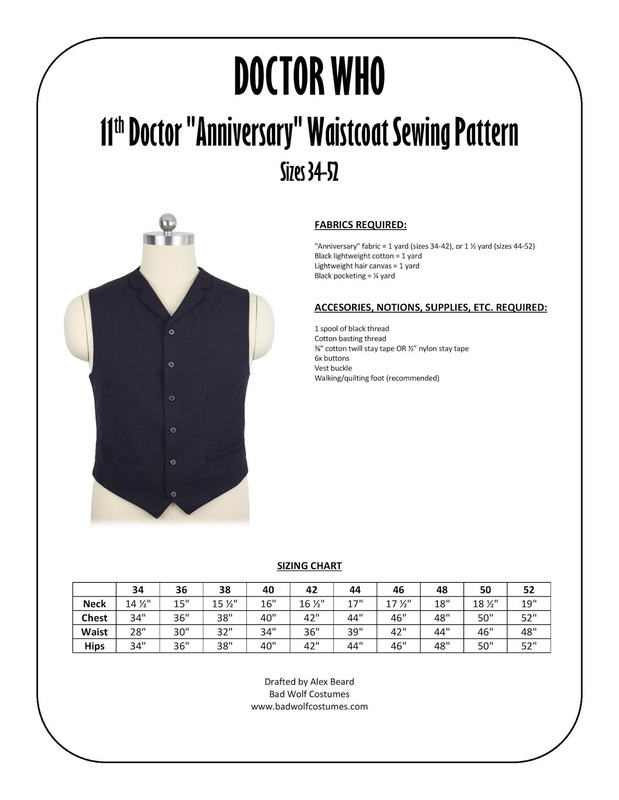 Our 11th Doctor "anniversary" waistcoat pattern is now shipping! Thank you, everyone who pre-ordered! Free sewing tutorial (intended for use with this pattern) is coming soon to the "Doctor Who Costume Guide!" Over the past few months, we've made several replica TNG skants for demonstration purposes (for our TNG skant sewing patterns and corresponding sewing tutorial). However, we have no interest in keeping them and would rather they go to happy new owners who will enjoy them instead. The women's skants were patterned directly off of an original, screen-used TNG skant. The first women's skant was made to fit a woman approximately 5'8" tall, with a 33" bust and 25" waist. It features authentic vents, interior construction, and front double-zipper closures. The second women's skant is the same size, but it's a conceptual season 3-7 variant, with the appropriate yoke and collar styles. It zips up the back like the later TNG-era jumpsuits did. The third women's skant is the season 1 style, and it's a direct 1:1 replica of the original, screen-used women's TNG skant we examined. It's made to fit a woman with a 35-36" bust and 28-29" waist. And finally, the men's skant is also the season 1 style, approximately a men's size 44. It was intended to fit a man approximately 5'11" to 6'2" tall, with a 43-44" chest, 37-39" waist, and 42" hips. It, too, features authentic vents, interior construction, and front double-zipper closures. 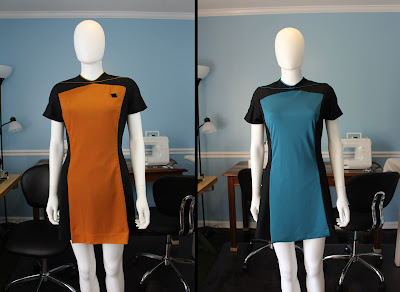 These TNG skants are great for cosplaying, but they also make impressive display pieces, too! This is a one-time-only kind of thing, and we're only selling the four of them, so grab one while you can! Again, the reason we're selling them is simple: we're always making new costumes and have many more patterns in the queue, but we simply don't have enough storage space or interest in cosplaying all of them. We'd rather these costumes go to owners who can appreciate and enjoy them!